Business owners are always interested in reading some quick tips to help their business grow. 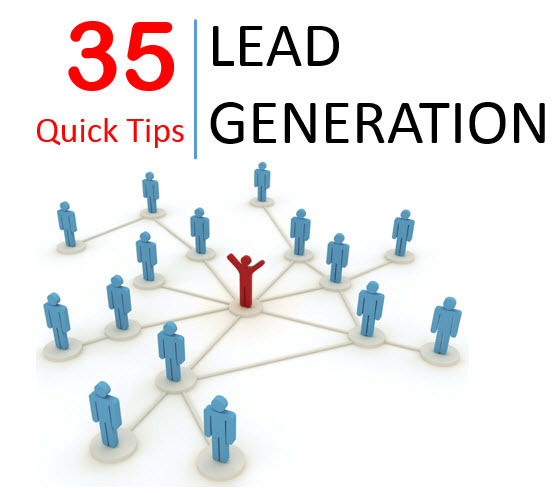 Below, we've compiled a list of 35 tips to help create lead generation for small business. Know your target audience as well as you do family and friends - It helps to know who your customer is. Make your website attractive to search engines - Use your blog to add current content/update engine rankings. Avoid the keywords everyone is using. Use long-tail low competition keywords to get traffic to your website. Make sure to have a strategy before adding content or making blog posts - Know the audience and the purpose. Focus each piece of content on one topic – Keeps customer attention and makes them more likely to share it. Link website content with social media - Customers will share and generate even more interest in your company. On a low budget? Avoid PPC. Use quality content to draw qualified people to your website and make leads. Offer quality incentives to entice website visitors to become leads - Mix them up offering different options. Make your titles Google friendly by integrating keywords. Visitors love tips, tricks, benefits, and mistakes. Develop a lead nurturing plan before you try enticing your first lead - Once you hook them, nurture them. Is LinkedIn a place to get business leads? If you are a B2B business, the answer is yes. Find out for sure. A LinkedIn lead is someone you communicate with, is part of your target audience, and have profile insight to. After a lead converts, nurture the customer relationship with instant thanks. Can lead to future business.